…… goodbye Emily. It’s been wonderful. 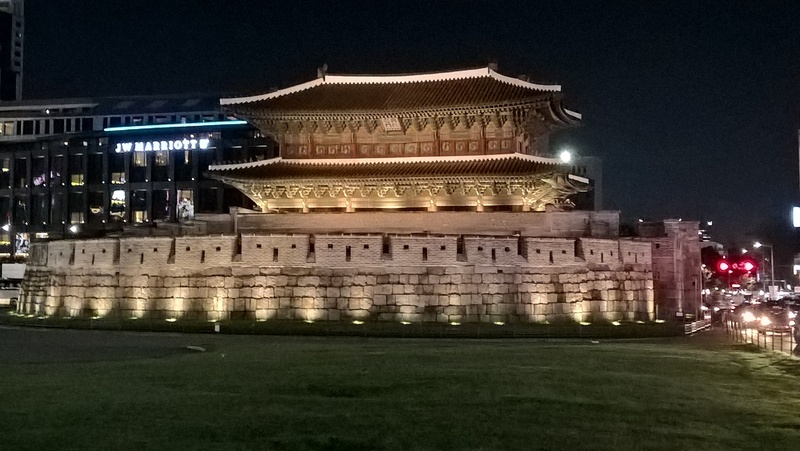 Here’s a photo we took this evening of one of Seoul’s old main city gates, Dongdaemun. Next to it is a street market, several modern hotels and high-rise buildings, endless traffic, shops, cheap restaurants. A real slice of Korean life. I feel for you having to leave her but know you have some shared lovely memories and had a wonderful experience. Hope you have a good journey – hope you oacked some woollies, it’s perishing! Hang on! I thought it was a real Indian summer just now? Soon find out! Thanks for the daily postcards. I have thoroughly enjoyed the visit. Only 13C today, keep your woolies in your hand luggage. Safe journey. Oh, I say! That’s a bit fresh! Thanks for coming. Have a safe journey home and thank-you for the fascinating insights into life in S Korea. Now I’ve heard about the weather, not looking forward to coming home one bit! But it’ll be good to see you. Love to you all and Team Yoga! Oops! That was supposed to be for Kevin as I always forward your blog. Just home from bunion op so blame it on the general anaesthetic! Looking forward to seeing you both soon and hearing all the details. Gosh. That sounds nasty. Hope you’ll be on your feet and ready to meet soon. Back home Sunday. Great. See you soon. We can’t believe you’ve been away a full month! And thanks for coming with us! Thanks for a most enjoyable visit to Korea! I’m glad you enjoyed it. We did too! I enjoyed learning about Korea via your posts. Your trip sounded wonderful. It was. Thank you. All we need to do now is sort out the jet lag.